KUALA LUMPUR, Malaysia (AP) — A Malaysia Airlines plane sent signals to a satellite for four hours after the aircraft went missing, an indication that it was still flying for hundreds of miles or more, a U.S. official briefed on the search said Thursday. Six days after the plane with 239 people aboard disappeared, Malaysian authorities expanded their search westward toward India, saying the aircraft may have flown for several hours after its last contact with the ground shortly after takeoff from Kuala Lumpur for Beijing. 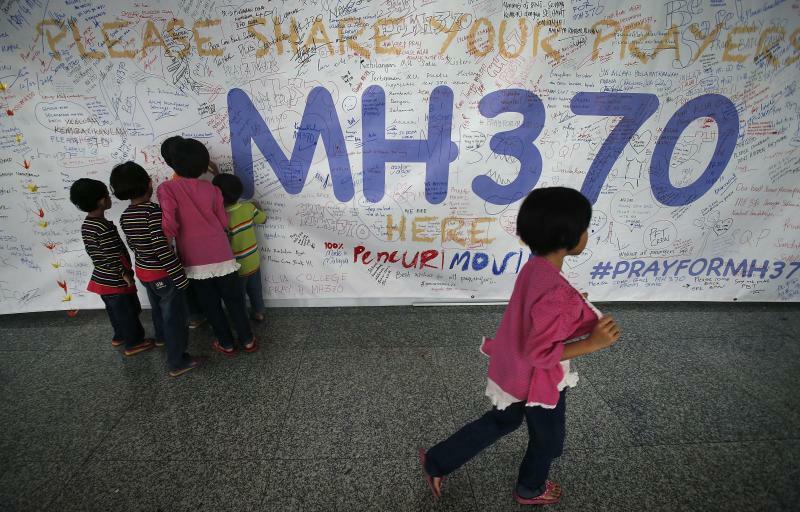 A string of previous clues about Flight MH370 have led nowhere. "MH370 went completely silent over the open ocean," said Malaysia's acting Transport Minister Hishammuddin Hussein. "This is a crisis situation. It is a very complex operation, and it is not obviously easy. We are devoting all our energies to the task at hand." The U.S. official, who spoke on condition of anonymity because he wasn't authorized to discuss the situation by name, said the Boeing 777-200 wasn't transmitting data to the satellite, but was instead sending out a signal to establish contact. Boeing offers a satellite service that can receive a stream of data during flight on how the aircraft is functioning and relay the information to the plane's home base. The idea is to provide information before the plane lands on whether maintenance work or repairs are needed. Malaysia Airlines didn't subscribe to that service, but the plane still had the capability to connect with the satellite and was automatically sending pings, the official said. "It's like when your cellphone is off but it still sends out a little 'I'm here' message to the cellphone network," the official said. "That's how sometimes they can triangulate your position even though you're not calling because the phone every so often sends out a little bleep. That's sort of what this thing was doing." The plane had enough fuel to fly about four more hours, the U.S. official said. Messages involving a different, more rudimentary data service also were received from the airliner for a short time after the plane's transponder — a device used to identify the plane to radar — went silent, the official said. If the plane had disintegrated during flight or had suffered some other catastrophic failure, all signals — the pings to the satellite, the data messages and the transponder — would be expected to stop at the same time. One part of the hunt is in the South China Sea, where the aircraft was seen on civilian radar flying northeast before vanishing without any indication of technical problems. 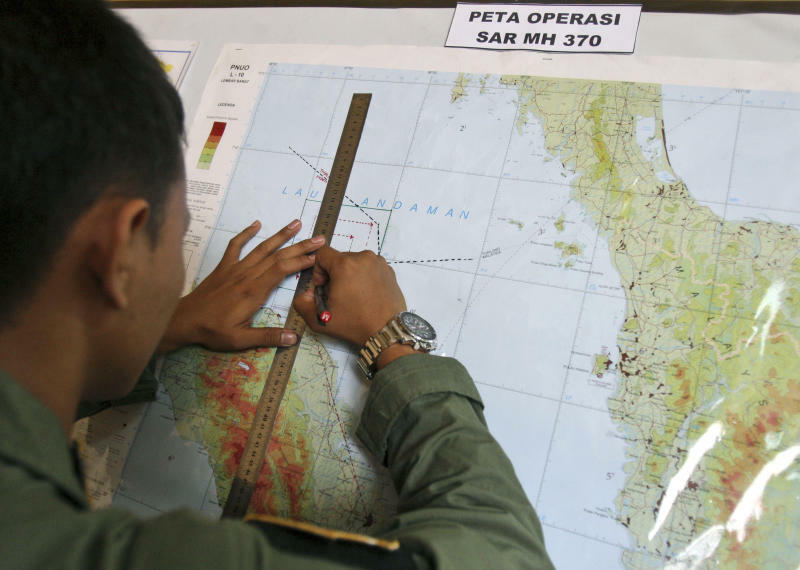 A similar-sized search is also being conducted in the Strait of Malacca because of military radar sightings that might indicate the plane turned in that direction after its last contact, passing over the Malay Peninsula. The total search area being covered is about 35,800 square miles (92,600 square kilometers) — about the size of Portugal. Asked if it were possible that the plane kept flying for several hours, Hishammuddin said: "Of course. We can't rule anything out. This is why we have extended the search. We are expanding our search into the Andaman Sea." The sea is northwest of the Malay Peninsula. He said Malaysia was asking for radar data from India and other neighboring countries to see if they can trace it flying northwest. 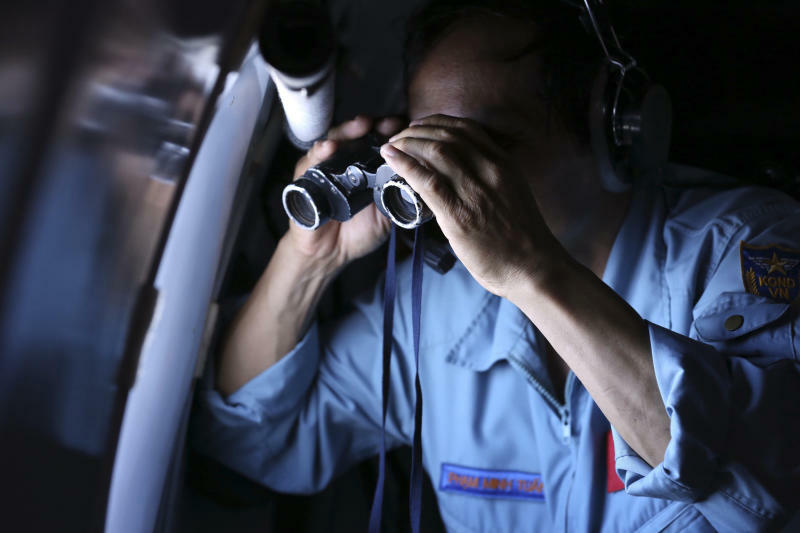 India says its navy, air force and coast guard will search for the plane in the south Andaman Sea. "Because of new information, we may be part of an effort to open a new search area in the Indian Ocean," White House spokesman Jay Carney said earlier Thursday, declining to offer additional details about that information or the new area. The U.S. Navy 7th Fleet said it is moving one of its ships, the USS Kidd, into the Strait of Malacca, west of Malaysia. In the latest disappointment, search planes failed to find any debris from the plane after they were sent Thursday to an area of the South China Sea off the southern tip of Vietnam, where satellite images published on a Chinese government website reportedly showed three suspected floating objects. "There is nothing. We went there. There is nothing," Hishammuddin said. More than two-thirds of those on Flight MH370 were from China, which has shown impatience with the absence of any results. Chinese Premier Li Keqiang said Thursday in Beijing he would like to see better coordination among countries in the search. The passengers' "families and friends are burning with anxiety. The Chinese government and Chinese people are all deeply concerned about their safety," he said at the close of the annual session of the country's legislature. "As long as there is a glimmer of hope, we will not stop searching for the plane." He said China had eight ships and 10 satellites searching for the plane. Malaysia has been criticized for its handling of the search, in part because it took several days to fully explain why it couldn't say whether the plane had turned back. Officials say they are not hiding anything and are searching areas where the plane is most likely to be, while trying to establish its actual location. — Oil slicks seen Saturday were found to have nothing to do with the jetliner. — A yellow object spotted by a search plane turned out to be ordinary sea trash. — Officials initially said four or five passengers checked in for the flight but did not board, fueling speculation about terrorism. Officials later said some people with reservations never checked in and were simply replaced by standby passengers, and no baggage was removed. — Officials said two men, later identified as Iranians, boarded the plane with stolen passports. It was later reported that they were unlikely to be linked to terrorist groups. Investigators have not ruled out any possible cause for the plane's disappearance. Experts say one possibility that could explain why the transponders were not working is that the pilot, or a passenger, likely one with some technical knowledge, switched off the transponders in the hope of flying undetected. Experts say that if the plane crashed into the ocean, some debris should be floating even if most of the jet is submerged. Past experience shows that finding the wreckage can take weeks or even longer, especially if the location of the plane is in doubt. Associated Press reporters Jim Gomez in Kuala Lumpur and Josh Lederman in Washington contributed to this report.